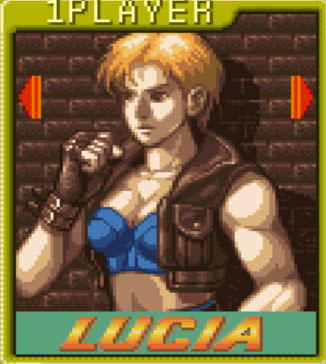 Lucia Morgan is one of the four playable protagonists in Capcom’s Final Fight 3, released for the Super Nintendo in 1995. Lucia did not appear in any other games so far. In Final Fight 3 she is the weakest but also the fastest of the characters and uses mainly kicks to attack. She is a police detective and fights alongside Mike Haggar against the Skull Cross Gang. She is seen together with Chun Li on a official illustration, who knows..maybe we see her in a future Street Fighter game as a big surprise. Lucia Morgan was drawn by Gino Descalzi as part of the FGE Project in December 2014.